I have to send out an apology to all our faithful viewers out there for the lack of posting lately, Carlene and I have both been quite busy in the other aspects of our lives and unfortunately BS’ In The Kitchen has taken a hit! On a positive note, we are still cooking up tasty meals and taking pictures, we just haven’t gotten around to posting. So you can expect a surge of new posts once we finally find the time to do them all! In the spirit of being busy here is a simple pasta recipe which can be whipped up in no time and serves 1-2 people. First start off by boiling some water for your pasta. While the water is starting to boil begin the salmon, you can cook it however you prefer, but I cut it into chunks and pan fried it for about 10-15 minutes with some lemon olive oil, salt and pepper. Once your salmon is about halfway through cooking add a little more olive oil to your pan, add the onions and once they start caramelizing add your spinach. 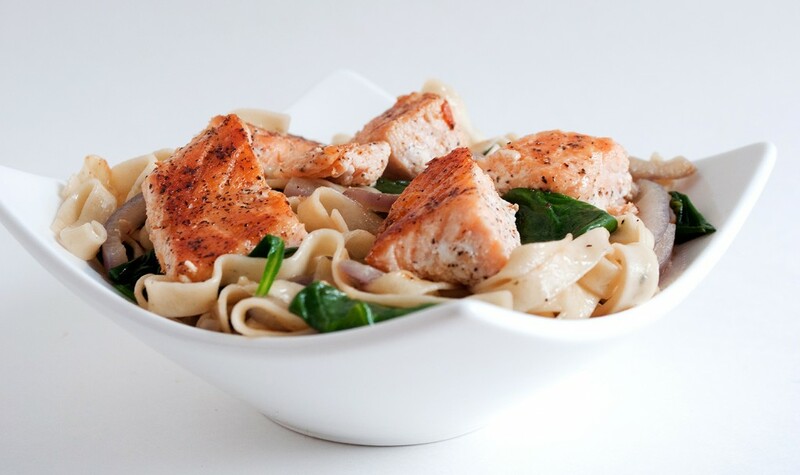 Cook until the salmon is done and your spinach is wilted, add the pasta into your pan to mix everything in, add some lemon juice, salt and pepper to taste and enjoy! Where did you get the pasta from? The pasta came from friends who did a trip to Pheonix, AZ over the winter and brought some back. We’ve had good luck shopping for unique pastas at HomeSense (or of course in Saskatoon at the Bulk Cheese Warehouse).